(i) a girl who is from, or lives in, Testaccio. (ii) a blog about life in Italy and the pursuit of stories. Writer and journalist Isobel Lee has lived in Rome for fifteen years, accepting the challenge to live like the Romans do and immerse herself in local culture. She chose the Eternal City’s former meat-packing district, Testaccio, to make her home, giving rise to her blog’s name, Testaccina. 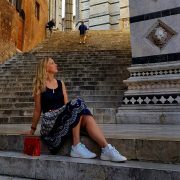 She has worked with The Wall Street Journal, The BBC, ITV, Channel 4, CNBC and MTV Italia, and written about Italy for the Daily Telegraph, Vogue, Easyjet, Brussels Airlines, Iberia, Thomas Cook, Wizz Air, Jet2 and Norwegian Airlines’ in-flight magazines, as well as When Saturday Comes, REurope, PropertyEU, EuroProperty and Italianicious. If you are interested in advertising on Testaccina.com or featuring in a sponsored article, please get in touch to request a media pack. If you would like to invite Testaccina to stay in your hotel or sample a meal or other kind of experience, please send a brief outline including your expectations in terms of coverage. As a blogger, Testaccina is occasionally invited to stay in lodgings overnight, is offered food or drink for free, or creates and publishes sponsored content. Whenever this occurs, it is fully disclosed in the article and Testaccina reserves the right to share her honest opinion. If you have any queries or concerns about any of the stories posted here, please let us know.